This is one of those issues that provides textbook case studies about controversy. From scientific controversy, through technical controversy and right into political debate. The truth is that all sides of this debate ignore a basic fact in many nutrition and health responses in general: biological individuality. It is true that milk consumption can cause a large number of health problems to many people. The first thing that comes to mind when we think of those is lactose intolerance, which is the inability to digest lactose, a milk carbohydrate, by humans beyond nursing age. Cow milk can also cause other forms of allergy and intolerance. Many protein components in cow milk can elicit allergic and inflammatory reactions in humans. Casein, the chief protein component in milk, has been shown to be associated with psychiatric and neurological symptoms, if not actually cause autism. The problem with such claims is a lack of probabilistic understanding of epidemiological facts and a proper appreciation of the genetic and physiological variability in our species. The claims may be all true, but certainly not to all the population. This is the origin of the controversy over human consumption of cow milk. Let’s start from the epidemiologically less significant claims and get to the core of the argument in this debate. The prevalence of Autism Spectrum Disorders (ASD) is a little over 1% of the American Population. Data for the whole world are not reliable. Of these, it is unknown what proportion has casein consumption related symptoms. For the sake of the argument, let as assume the extreme situation that it is 100%. Gastrointestinal inflammatory disorders affect less than 1% of the world population according to the CDC, although the scholarly work on this matter may be conservative since only ambulatory cases are counted. Let us assume 1% – again, for the sake of argument. Lactose intolerance, though, affects more than 50% of the human population. Some authors claim that cow milk intolerance in general may affect over 70% of the human population. And this is probably true, here is why: the physiological adaptations that made it possible for humans to use other mammals’ milk as a source of nutrients are evolutionarily recent. The spread of the genetic mutation the provided this ability occurred about 8.000 years ago in Northern Europe. Therefore, the ethnic distribution of lactose intolerance makes a lot of sense: while it affects over 80% of African and Asian ethnicities, it may affect less than 10% Caucasians. The majority of people from Scandinavia and the British islands are lactose and milk tolerant. So any claim in the form of “such and such food is bad for humans” (or athletes, assuming we are talking about human athletes) begs the question: which humans? We are not, have never been in the last 30 thousand years, and will never be a genetically homogeneous population. Unfortunately, the debate engaged unprepared scholars and non-scholar sports commentators and athletes and both groups simply trashed the issue. There is a website called “NOTmilk” to “educate” people on the hazards of this unhealthy food. Embarrassing. There are athletes who dismiss any argument concerning the wide prevalence of milk intolerance and consider milk an indispensable item for sports performance. Both are outright wrong. For the adapted populations, cow milk is actually a wonder food in every sense. 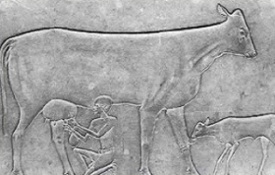 Not only it is nutritiously an excellent item, in protein quality but also micro-nutrients and carbs, but according to at least one author, Peter Forbes (The Milk of Human Conquest), it might have been instrumental in the successful colonization and civilizatory dominance of some Caucasian populations whose original environment was actually not favorable at al. I would like to wrap up this article with my own personal experience with milk. It took me a while to figure out my own physiological food preferences, quite conflicting with those of the default “healthy” diet (as it is probably clear by now, I don’t believe there is such a thing as a universal healthy diet). I have serious problems with carbohydrates, for example. For starters, I am hyperinsulinemic. High glycemic index carbs don’t agree with me. Recently, we obtained solid evidence that carbohydrate consumption was directly related to some very serious neurologic-psychiatric conditions of mine (epilepsy and bipolar disorder). I call them conditions because I don’t believe they are diseases – hang on, I’ll get there. About the same time, we surprised the coaching and sports science community with the fact that I produce higher levels of athletic performance on very low carbohydrate diets (very, very low): I am an international elite level athlete in my sport (powerlifting) and my diet is protein, vegetables and fat. Taking carbs off the table seemed to have solved all the problems except one: a persistent colon soreness and discomfort. Dairy products had been taken off my diet for more than a year and still I felt the colon discomfort. After the last World Championship, I decided to reintroduce dairy products in my diet, especially yogurt, one of my favorite foods. Well, the colon discomfort is gone. I have always loved dairy products, which has nothing to do with it being physiologically good for me: I crave sweet foods and I know they are poison in my system. In this case, it seems, I actually need dairy products. Maybe most of my “disorders” were not disorders at all, after all. Maybe they were only an expression of the fact that I am not physiologically adapted to the current “healthy diets” – be they western or eastern. I might have inherited genes that made me a good fat fuel metabolizer, extreme carbohydrate efficient oxidizer (meaning I need minute amounts of it), meat eater and dairy tolerant (or symbiont!) animal – who knows? Maybe many people out there are being treated for non-existent diseases when all they needed was some bacon and cheese. Biological individuality is not only about genetic makeup. It is also about intestinal microbiota. Each person has a unique microbiological ecological profile. Intestinal microbiota (gut flora) dictate not only how we digest the food we consume, but many other things such as inflammation, immunological response and even mood. Bottom line is that we need to grow up and be intellectually mature concerning nutritional claims. While it is a great advancement in science to connect trans-fat consumption with cancer incidence, general claims as to the benefits or hazards of foods such as cow milk, chicken eggs, beef, poultry or pork meat, etc. are just plain wrong. They go against the most basic fact about human physiology: biological individuality and populational variability. Bartley J, McGlashan SR. Does milk increase mucus production? Med Hypotheses. 2010 Apr;74(4):732-4. Huncharek M, Muscat J, Kupelnick B. Colorectal cancer risk and dietary intake of calcium, vitamin D, and dairy products: a meta-analysis of 26,335 cases from 60 observational studies. Nutr Cancer. 2009;61(1):47-69. Lakatos PL. Recent trends in the epidemiology of inflammatory bowel diseases: up or down? World J Gastroenterol2006;12(38):6102–08. Loftus EV. Clinical epidemiology of inflammatory bowel disease: incidence, prevalence, and environmental influences. GastroMay 2004;126(6):1504–17. Steinhoff, U (2005). “Who controls the crowd? New findings and old questions about the intestinal microflora”. Immunology Letters 99 (1): 12–6. Tseng M, Breslow RA, Graubard BI, Ziegler RG. Dairy, calcium, and vitamin D intakes and prostate cancer risk in the National Health and Nutrition Examination Epidemiologic Follow-up Study cohort. Am J Clin Nutr. 2005 May;81(5):1147-54.